ENSENADA — Members of the 11th U.S. Coast Guard District participated in a joint two-day search and rescue exercise, SAREX, with members of the Mexican navy’s Search and Rescue Station in Ensenada, Mexico, Dec. 5-6. The visit included a flag officer professional exchange, presentations highlighting each country’s search and rescue capabilities, and a multiple-scenario tabletop exercise requiring joint coordination and response. “The overall objective of the United States and Mexico Search and Rescue Exercise is to exercise the interoperability of the U.S. Coast Guard and Mexican navy,” said Capt. Arthur Snyder, the 11th Coast Guard District Chief of Incident Management. The exercise aligns with the U.S. and Mexico Search and Rescue Treaty. This longstanding bilateral agreement, originally drafted in 1935 and revised in 1989, is called the Assistance to and Salvage of Vessels in Territorial Waters. This serves as the fundamental policy doctrine for SAR coordination between the U.S. and Mexico. It emphasizes continual joint training in order to maintain operational proficiency and international cooperation. The 11th Coast Guard District, Mexican navy and Search and Rescue Station Ensenada strive to conduct the U.S. and Mexico SAREX annually, with the host country typically alternating each year. The SAREX included a six-scenario tabletop exercise, during which Coast Guard and Mexican navy representatives presented three scenarios each, then worked together to find the best course of action to solve the hypothetical situations. Through discussions, both sides were able to identify strengths and gaps in their current procedures, while finding ways to streamline and improve SAR response coordination. 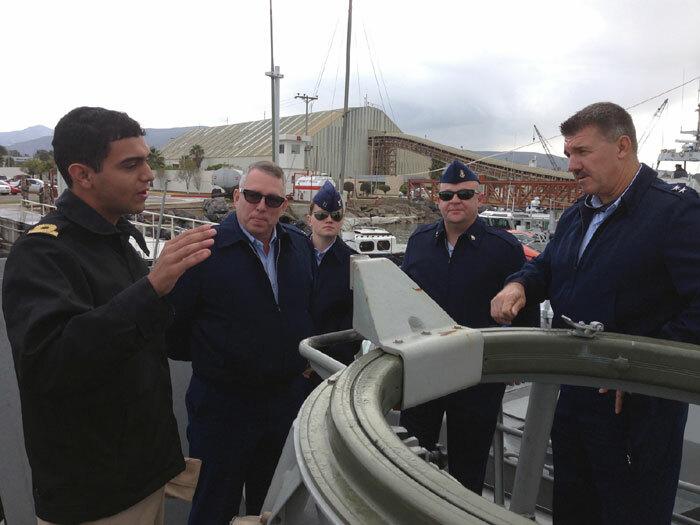 The event also afforded members of the 11th Coast Guard District an opportunity to tour the Second Naval Region Base in Ensenada, as well as the naval vessel Monasterio, a ship that routinely conducts fisheries and law enforcement patrols in Mexico’s waters. The Second Naval Region also organized an area familiarization trip aboard one of its high-speed Interceptor Response Boats, as well as a K-9 unit exhibition where handlers demonstrated how the dogs carry out contraband detection and train to maintain a high level of fitness and proficiency. Lunch and dinner events between participants enabled both parties to continue reinforcing international ties at the flag, senior staff and watchstander levels. The event allowed members to meet and discuss recent search and rescue cases, law enforcement operations and shared ideas on how to further strengthen the partnership and collaboration between their agencies.